There are definitely a few things I’m going to miss about New York. Cheap manis and pedis are at the top of my list. Tiny, smushed nail salons crammed with always smiling, anxious-to-please staff are a fixture on almost every block. You can get in and out in under an hour and go from being a dog walker with hands who look like they belong to a lumberjack to someone who feels pampered and pretty. Because the recession has hit the beauty industry hard, my nail salon has been having a 40% off sale for the last three months. This means you can get a mani and pedi pretty much for free. My favorite part of the experience isn’t the massage chairs, or even the services themselves. I just love to people watch. Today’s experience was typical of what goes on there. I hadn’t been in since December, so I was greeted like an old friend. Well, after being harshly told to “Pick a color,” which is what the owner Kim says to everyone, I was greeted warmly by the women who work there. I see them fairly regularly in the summer and on warmish days in the winter–I refuse to put shoes back on after the pedicure, so it has to be above freezing for me to do the two block sprint back to my house in flip-flops. The two people who caught my attention today were a sixty-year-old, balding man with some gnarly toes and a woman who was getting acrylic nails and bitching the whole time. The bitching woman spent two hours, or so she kept saying, spent around $50 on services, then left the manicurist a $4 tip. The poor girl was so happy to see her go, I don’t think she even noticed the crappy tip, but I was outraged on her behalf. The balding guy was extremely polite until it came time to do the polish. I know some guys like the clear polish on their toes, but this guy wanted silver sparkles. Much snickering in Spanish occurred as it was made clear that this is what Funky Feet wanted. He then explained to the rest of us who were sitting on the chairs near him that he wasn’t gay. Well, first he tried to use a slang derogatory Spanish expression to explain it to the pedicurists, then resorted to all manner of insulting gay words in his vocabulary to try to convince us of his heterosexuality. I believed him on sight. No self-respecting gay man of my acquaintance would be sporting feet like those. Apparently the man’s wife forces him to go in and likes it when he paints his toes. Fine. Each to his own. But when the man mentioned they were heading to Florida tomorrow, I finally let out a barking laugh of my own. The thought of those ugly, humongous, silver-lame, sparkling toes walking on the beach was just too much. As for me, I got my beauty in, over tipped my people to compensate for the bitching woman, then did my flip-flop sprint home. Cinder, always happy to see me, greeted me by promptly stepping on my toes. ← Her name is Mud! Dennis and I thoroughly enjoyed visiting the Poliziano Vineyard with you as our guide. (We were the newly married ‘older’ couple – I teach and speak Italian and Dennis, the sportsman, does not …) If you recall, I purchased your book, “at least you’re in Tuscany” for my mother, and you and Fabbio inscribed it. Well, I finished the book on my way home from Rome, and loved it! I could really relate, and still learned so much. 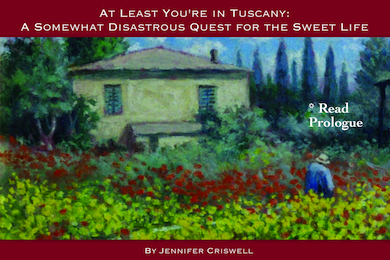 It is a charming memoire of your courageous move to Italy, and becoming an Italian. I wanted to ask you something grammatical. On page 129 when Marinella says, “Mi piace i miei dolci dolci”, usually the verb “piacere” is conjugated to the subject, which is plural (i.e. i dolci). Do Italians consider the word “dolci” singular when used in this context? It was a real pleasure meeting you and Dennis as well!! Thank you for your kind words on the book. I am happy you enjoyed it! I am sure you are right on the conjugation of mi piace and that it should be plural but will check with my editor who lives in Calabria to see if there was a reason we left it like this. Any grammar mistakes are definitely mine! I hope you and Dennis enjoyed the rest of your trip and that we see you again in the future! !